The EFL Cup (referred to historically, and colloquially, as simply the League Cup), currently known as the Carabao Cup for sponsorship reasons, is an annual knockout football competition in men's domestic English football. Organised by the English Football League (EFL), it is open to any club within the top four levels of the English football league system – 92 clubs in total – comprising the top level Premier League, and the three divisions of the English Football League's own league competition (Championship, League One and League Two). First held in 1960–61 as the Football League Cup, it is one of the three top-tier domestic football competitions in England, alongside the Premier League and FA Cup. It concludes in February, long before the other two, which end in May. It was introduced by the league as a response to the increasing popularity of European football, and to also exert power over the FA. It also took advantage of the roll-out of floodlights, allowing the fixtures to be played as midweek evening games. With the renaming of the Football League as the English Football League in 2016, the tournament was rebranded as the EFL Cup for the 2016–17 season. The tournament is played over seven rounds, with single leg ties throughout, except the semi-finals. The final is held at Wembley Stadium; it is the only tie in the competition played at a neutral venue and on a weekend (Sunday). Entrants are seeded in the early rounds, and a system of byes based on league level ensures higher ranked teams enter in later rounds, and to defer the entry of teams still involved in Europe. Winners receive the EFL Cup, of which there have been three designs, the current one also being the original. Winners also qualify for European football, receiving a place in the UEFA Europa League; should the winner also qualify for Europe through other means at the end of the season, this place is transferred to the highest-placed Premier League team not already qualified for European competition. The current holders are Manchester City, who beat Chelsea 4–3 on penalties in the 2019 final to win their sixth League Cup. 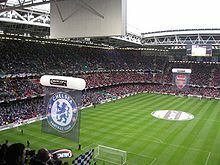 Although the League Cup is one of the four domestic trophies attainable by English league teams, it is perceived as being of lower prestige than the league championship or the FA Cup; the fourth domestic trophy, the Community Shield, is a one-match event. League Cup winners receive £100,000 prize money (awarded by the Football League) with the runners-up receiving £50,000, considered relatively insignificant to top-flight teams, compared to the £2 million prize money of the FA Cup, which is in turn eclipsed by the Premier League's television money (awarded on final league position) and consequent participation in the Champions League. Some clubs have repeatedly fielded a weaker side in the competition, making the opportunity for giant-killing of the larger clubs more likely. Many teams in the Premier League, Arsenal and Manchester United in particular, have used the competition to give young players valuable big-game experience. However, in 2010, in response to Arsène Wenger's claim that a League Cup win would not end his trophy drought, Alex Ferguson described the trophy as "a pot worth winning". The original idea for a League Cup came from Stanley Rous who saw the competition as a consolation for clubs who had already been knocked out of the FA Cup. However it was not Rous who came to implement it, but Football League Secretary Alan Hardaker. Hardaker initially proposed the competition as a way for the clubs to make up on lost revenue, due to a reduction in matches played, for when the league was to be re-organised. The re-organisation of the league was not immediately forthcoming; however, the cup competition was introduced regardless. Trophy of the competition when it was called "Milk Cup"
The trophy was paid for personally by Football League President Joe Richards, who was proud of the competition and he had his own name engraved on it. Richards described the competition's formation as an 'interim step' on the way to the league's re-organisation. Richards' priority was the re-organisation of the leagues; 'perhaps by cutting down the number of clubs in each division, as has already been suggested, and even given more consideration to the system of four up and four down'. Hardaker felt that the Football League needed to adapt to the times, as the English game was losing prestige. He felt that the Football League should take the lead in revitalising football in the nation: "It must be obvious to all of you that the time has come to do something, and it is up to the Football League to give the lead. I hope the Press will not immediately assume that the League is going to fall out with the F.A. or anybody else... the time has come for our voice to be heard in every problem which affects the professional game." The League Cup competition was established at a time when match day attendances were dwindling. The league had lost one million spectators compared to the previous season. It was established at a time when tensions between the Football League and the Football Association were high. The biggest disagreement was about how revenue was shared between the clubs. During the late 1950s, the majority of senior English clubs equipped their grounds with floodlights. This opened up the opportunity to exploit weekday evenings throughout the winter. 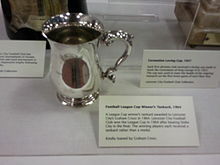 The League Cup was introduced in the 1960–61 season specifically as a mid-week floodlit tournament, to replace the Southern Professional Floodlit Cup. The League Cup was criticised by the better-endowed clubs. The Times' correspondent at the time felt that the League Cup was a step in the wrong direction; the European Cup had been formed five years prior to the League Cup and the correspondent felt the League Cup's introduction was adding to existing problems. The Times published on 30 May 1960: "Where a drastic reduction is required in an attempt to raise quality, no doubt quantity and a further spread of mediocrity will be the dose. Where men like Count Bernabeu with his wider horizons, think in terms of a European League for the future in which a lead could surely now be given jointly by our leaders, the Football League propose next season to implement their useless Football League Cup to be played in midweek. It gets the players, the clubs and the public nowhere." Aston Villa were the inaugural winners in 1960–61, defeating Rotherham United 3–2 in the final over two legs. Football in England was considered to be of a low quality, compared to what was being played on the continent, as relatively unfashionable clubs Burnley and Wolverhampton Wanderers were England's representatives in Europe that year, having lifted the major honours ahead of much bigger clubs like Arsenal and Manchester United. Richards referred to the appetite for European football as 'continental fever'. He was keen for the league to re-establish itself: 'We must be prepared to put the interests of the League and the game before individual clubs.' Sixteen clubs opposed the competition's creation, thirty-one approved it. The average attendance across the League Cup was 10,556, just higher than the average gate in the Third Division. The total attendance of the Football League competition had fallen by four million from the previous season. Richards is reputed to have told Hardaker that he foresaw 'the League Cup final being held at Wembley, but that it wouldn't be during his lifetime'. The first League Cup final to be held at Wembley was Third Division Queens Park Rangers's win over First Division West Bromwich Albion on 4 March 1967. Richards died in 1968. The first League Cup was won in 1960–61 by Aston Villa who, at the time, held the overall record for major trophies won in England. The next three finals, however, saw the trophy won by clubs who had never won a major trophy before. One of them, Norwich City, had yet to even play in the First Division, while their opponents Rochdale had played no higher than the Third Division. The introduction of the League Cup gave the Football League more negotiating power with the FA and UEFA. Hardaker threatened UEFA with a boycott of the UEFA Cup, unless UEFA gave the League Cup winner European qualification. As a result of the negotiating tactics, UEFA provided the League Cup winner with a place in the European competitions, providing the team was in the first division. Tottenham Hotspur were the first team to qualify for Europe by virtue of winning the competition. Although Leeds United had won the competition before Tottenham, Leeds qualified for Europe based on league position. The winners of the 1966–67 and 1968–69 editions, Queen's Park Rangers and Swindon Town did not participate in Europe, as they were not in the First Division. Prior to the agreement with UEFA, the competition was not considered worthy of the larger clubs' attention. However, once a position in Europe was on offer, as was a final at Wembley Stadium, the competition's standing was improved and in the 1968–69 season only Manchester United declined to participate. Everton chose not to compete in 1970–71 so that they could concentrate their efforts on the European Cup. Entry was made compulsory for all Football League teams the following year. Liverpool have won the cup on the most occasions with eight victories, including winning their four League Cups in successive years in the early 1980s. They completed two trebles of trophy wins, in 1983–84 and 2000–01, winning the League Cup in both of these years. English clubs lost their place in European competitions for an indefinite period in 1985 as a result of the Heysel disaster, where Liverpool fans had taken part in a riot at the European Cup final, resulting in the death of 39 spectators. That year's winners of the League Cup were Norwich City, who would otherwise have played in a European competition for the first time in the 1985–86 season. Oxford United, Arsenal, Luton Town and Nottingham Forest also missed out on the chance to compete in the UEFA Cup as League Cup holders over the next four years. Even when the ban was lifted in 1990, League Cup winners did not participate in European competitions for two more years, when Manchester United won the trophy and qualified for the UEFA Cup anyway, as they had finished second in the league. In the previous two seasons, Nottingham Forest and Sheffield Wednesday had both been prevented from competing in the UEFA Cup as League Cup winners, due to the gradual reintegration of English clubs in European competitions. In 2016–17, the competition was renamed the EFL Cup as part of the Football League's rebranding to become the English Football League. In the early 21st century, following restructuring of European football, and particularly its international club competitions the UEFA Champions League and UEFA Europa League, there were considerations of removing the prize of European qualification from the League Cup's winners. It has retained its Europa League berth, however, leaving England the only UEFA member aside from France to offer a European berth to the winners of their second cup competitions. This has allowed the League Cup to retain popularity, especially with fans of clubs for whom success in cup competitions offers their only realistic chance of qualifying for Europe. Giant killings are less well remembered in the League Cup than the FA Cup due to the absence of non-league sides and the fact that many big clubs have fielded very under-strength sides when knocked out. However, there have been some notable upsets, such as Fourth Division side Chester beating league champions Leeds United 3–0 en route to the semi-finals in 1974–75. In 1995–96, Manchester United were beaten 3–0 at home by York City in the second round, first leg; United could only win 3–1 in the second leg and went out 4–3 on aggregate (York went on to repeat the achievement against Everton the following year). Also, the final of 1966–67 saw Division Three side Queens Park Rangers come from 2–0 down at half time to win 3–2 against top-flight West Bromwich Albion in the first League Cup Final to be hosted at Wembley Stadium. Two years later in 1968–69, Third Division side Swindon Town beat Arsenal 3-1 after extra time in the final to win the trophy. Manchester United have also been knocked out by Southend United and Coventry City in 2006–07 and 2007–08 respectively: in the match against Southend they fielded a strong side with 10 internationals, bucking a trend they had themselves started. In the 2014–15 season, Manchester United fielded five international players but lost 4–0 in the second round (in which they entered the tournament) against third-tier side MK Dons. In 2001–02, holders Liverpool were defeated 2–1 at home by Grimsby Town, then humbled again by Northampton Town in September 2010. Grimsby recorded another giant killing in 2005 by knocking out Tottenham Hotspur. In the 2012–13 competition, League Two (fourth tier) side Bradford City knocked out Premier League sides Wigan and Arsenal en route to a semi-final disposal of another top tier side, Aston Villa, 4–3 on aggregate, to reach the final, becoming the lowest-ranked team to do so since Rochdale in 1961–62. Swansea City, in their centenary year, became the first team from outside England to win the League Cup on 24 February 2013, when they beat Bradford City 5–0 to win their first major English trophy. Former League club and now defunct Scarborough defeated Chelsea 4–3 on aggregate in October 1989, while a Division 4 club. In 1992–93, Scarborough then defeated Coventry City (then a top-tier side) 3–2 on aggregate, before ultimately going out of the competition, narrowly, 1–0, against Arsenal. The League Cup is open to all 92 members of the Premier League and English Football League and is divided into seven rounds, organised so that 32 teams remain by the third round (with the exception of the 1961–62 competition). Since 1996–97, teams involved in European competition during the season have received a bye to the third round; the remaining Premier League teams enter at the second round, and the remaining Football League teams enter at the first round. If the number of byes causes an odd number of teams to enter a round, another team may be given a bye (usually the highest-placed team of those relegated from the Premier League the previous season) or a preliminary round may be played between the two teams promoted from the Football Conference the previous season (or, if only one team is promoted, that team would play against the lowest-placed team not to be relegated from the Football League the previous season); preliminary rounds have only been necessary in the 2002–03 and 2011–12 competitions. Up to 1995–96, all teams were involved by the second round, although some received byes to that stage. Matches in all rounds are single-legged, except for the semi-finals, which have been two-legged since the competition began. The final was two-legged from 1961 to 1966, but has been single-legged ever since. The first round was two-legged from 1975–76 to 2000–01, and the second round was two-legged from 1979–80 to 2000–01. Single-legged matches would be replayed as necessary until 1993–94, when penalties were introduced to settle the first replay; the last single-legged tie to require a replay was played in 1996–97. Until 1974–75, two-legged ties that remained level after extra time in the second leg would be replayed; in that time, three ties reached a third replay. Between 1975–76 and 1979–80, ties would still be replayed, but a penalty shoot-out would be used to settle ties that could not be decided after a replay; replays of two-legged matches were finally abolished for 1980–81, with the away goals rule and penalties being adopted instead. The semi-finals were the exception to this, with level ties being replayed until 1986–87, after which the away goals rule and penalties were introduced. From 2018–19, extra time was scrapped for all rounds except the final, and the away goal rule was scrapped for the semi-final, with level ties going straight to a penalty shoot-out. For the first six seasons of the Football League Cup, the final was played over two legs, with each leg being played at the home ground of each finalist. Since 1967, the final has been played as a single match at Wembley Stadium, although the Millennium Stadium in Cardiff was used between 2001 and 2007, following the demolition of the old Wembley. Between 1967 and 1997, finals that finished level after extra time were replayed at an alternative venue until a winner was decided. The only final to require two replays was the 1977 final between Aston Villa and Everton. The venues that hosted replays were Hillsborough Stadium in Sheffield, Old Trafford and Maine Road in Manchester and Villa Park in Birmingham. Since 1998, finals that have finished level after extra time have been decided by penalty shoot-out. Until 1999–2000, the final was played in late March or early April. Thereafter it has been played in late February or early March. Since 1989–90, the best player in the League Cup Final has been presented with the Alan Hardaker Trophy, named after Alan Hardaker, the former secretary of the Football League who devised the Football League Cup. John Terry, Ben Foster and Vincent Kompany are the only players to win the award more than once. The winners receive the EFL Cup, of which there have been three designs – the current one also being the original, a three-handled Georgian-style urn with a separate plinth (added later). Designed and manufactured by Mappin & Webb, it weighs 2.976 kg and measures 27 cm by 20.5 cm. It is worth around £20,000. It was used until the 1980–81 competition, before coming back into use ever since the 1990–91 competition. The reason for the break in usage was the introduction for the first time of a competition sponsor – the Milk Marketing Board, who chose to award their own trophy from 1981–82 to 1985–86. The next sponsor, Littlewoods, also chose to award their own trophy, from 1986–87 until 1989–90. Later sponsors have used the original. In the United Kingdom and Republic of Ireland, 15 matches will be broadcast live by Sky Sports through 2024 with highlights from the several matches on Quest through 2022. This competition is included in the EFL broadcast package. ^ a b c "The Trophy". capitalonecup.co.uk. Archived from the original on 14 March 2016. Retrieved 28 February 2016. ^ DeBruler, Paul. "Let's Remove the Premier League from the League Cup". SB Nation. Vox Media. Retrieved 17 July 2016. ^ "Frequently asked questions about the F.A. Premier League, (How are television revenues distributed to Premier League clubs?)". Premier League. Retrieved 11 December 2007. ^ "MU boss vows to field young guns in the League Cup final". The Star. 28 February 2009. Archived from the original on 1 March 2009. Retrieved 27 February 2011. ^ "Carling Cup worth winning says Manchester United manager Sir Alex Ferguson". Daily Post. 26 February 2010. Retrieved 27 February 2010. ^ a b Inglis, Simon. Football League and the men who made it. Harper Collins. p. 215. ISBN 978-0002182423. ^ "The Southern Professional Floodlit Cup 1955–1960". Footysphere. 22 September 2009. Retrieved 11 November 2012. ^ a b Inglis, Simon. Football League and the men who made it. Harper Collins. p. 216. ISBN 978-0002182423. ^ Inglis, Simon. Football League and the men who made it. Harper Collins. p. 228. ISBN 978-0002182423. ^ Inglis, Simon. Football League and the men who made it. Harper Collins. p. 205. ISBN 978-0002182423. ^ "European qualification for UEFA competitions explained". premierleague.com. Retrieved 7 November 2018. ^ "The Competition - EFL". efl.com. Retrieved 7 November 2018. ^ "Southend 1-0 Man Utd". BBC Sport. 7 November 2006. Retrieved 28 August 2014. ^ "Manchester United loss to MK Dons: press, fan, coach and player reaction". news.com.au. News Corp Australia. 27 August 2014. Retrieved 28 August 2014. ^ a b c d e f g h i j k l m "The Football League Cup". soccer.mistral.co.uk. SoccerData. Retrieved 29 August 2012. ^ "Carling Cup set for preliminary round". The Football League. 13 June 2011. Archived from the original on 16 December 2013. Retrieved 29 August 2012. ^ "Carabao Cup: Extra time scrapped & VAR to be used at Premier League grounds". BBC Sport. 8 June 2018. Retrieved 9 June 2018. ^ "2018/19: Carabao Cup rule changes". Retrieved 7 November 2018. ^ "Alan Hardaker Trophy". EFL. Retrieved 27 July 2018. ^ "Football: Coca-Cola sign Cup deal". The Independent. London. 1 August 1992. Retrieved 21 September 2011. ^ Bond, David (3 April 2002). "Worthington to end Cup sponsorship". London Evening Standard. Archived from the original on 13 September 2012. Retrieved 5 September 2011. ^ "Carling Cup sponsorship extended". BBC Sport. 18 December 2008. ^ "Capital One sponsorship agreed". Archived from the original on 8 August 2012. ^ "Carabao 'bring it on' and become new sponsor of EFL Cup". efl.com. English Football League. 4 November 2016. Retrieved 4 November 2016. ^ "From Luton Town Official website". Archived from the original on 25 July 2012. Retrieved 21 April 2009. ^ "Sky Sports extends EFL contract until 2024, broadcasting 138 live games per season". Sky Sports. Retrieved 8 January 2019. ^ Brown, Graeme; Johnson, Greg (1 September 2018). "What is Quest TV? Everything you need to know". footballlondon. Retrieved 8 January 2019. ^ a b c d e "League Cup Records". Coors Brewers. Retrieved 1 February 2009. ^ Surlis, Patrick (30 November 2016). "Liverpool 2–0 Leeds: Divock Origi and Ben Woodburn on target as Reds advance to EFL Cup semi-final". Sky Sports. Sky. Retrieved 30 November 2016. ^ Begley, Emlyn (23 January 2019). "Burton Albion 0 Manchester City 1". BBC Sport. British Broadcasting Corporation. Retrieved 23 January 2019. ^ McNulty, Phil (24 February 2013). "Bradford 0–5 Swansea". BBC Sport. British Broadcasting Corporation. Retrieved 24 February 2013. ^ Smith, Ben (30 October 2012). "Reading 5–7 Arsenal". BBC Sport. British Broadcasting Corporation. Retrieved 22 January 2014. ^ "Dagenham & Redbridge 6-6 Brentford". BBC Sport. British Broadcasting Corporation. 12 August 2014. Retrieved 14 August 2014. ^ "Derby County 1 1 Carlisle United". BBC Sport. British Broadcasting Corporation. 23 August 2016. Retrieved 24 August 2016. ^ "Ashley Chambers player profile". lcfc.com. Leicester City FC. Archived from the original on 15 March 2012. Retrieved 21 February 2009.